You guys – I think I may have discovered my new favourite savoury pie! I had company coming over to visit this past weekend and I wanted to create something flavourful and memorable. And I think I did with this Rustic Bacon, Herb & Vegetable Pie. 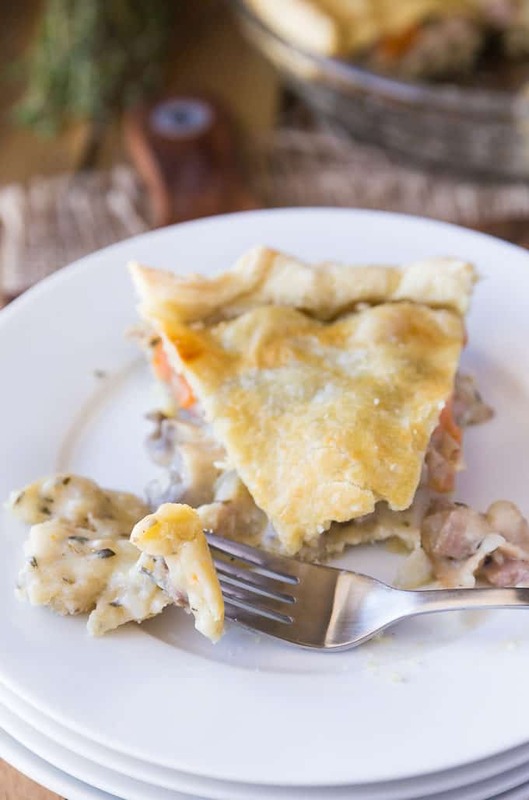 I don’t often make savoury pies, but after making this simple recipe, that’s about to change. You’ll need to pick up some unsweetened Almond Breeze to make this recipe at home. It’s used in the pie crust and filling. It’s a great recipe for people who can’t eat dairy like one of my guests! Almond Breeze is a great dairy-free alternative and it’s also lactose and gluten-free. It’s tasty on its own or can be used in your recipes in place of milk. It’s made from real California almonds from Blue Diamond’s cooperative who have been in the almond business for 100 years. I called it “rustic” because it isn’t fancy schmancy like some perfect pies you’ll see on Pinterest. It’s real and made with love though. It tastes delicious and I think that is what matters the most! If you want to save a step you could buy a frozen pie crust and use that. However, it’s really easy to whip up the dough for this crust. You don’t even have to roll it. It’s crumbly so you have to press it into the pie shell like you would with graham cracker crumbs. I think it adds to the rustic feel of this dish. And the filling…..soooooo good! It’s made from a blend of fresh vegetables, fresh herbs, bacon all tucked into a creamy sauce. One simple trick to get the sauce nice and thick is to add cornstarch. Stir it in and within minutes your sauce will change to a creamier consistency. One way to tell if your sauce is thick enough is to drag the spoon across the bottom of the pan. If you can see a trail of the bottom of the pan, you’ll know you have it right. I cheated a bit with the top crust and used some thawed puff pastry that I rolled out. It adds a tender, flaky texture and flavour. The pie takes about 30 minutes to bake in the oven. The top crust will be golden. Wait a few minutes before serving because the filling inside will be hot. If you have leftovers, put them in the fridge and enjoy the next day. It tastes delicious heated up in the microwave the next day. Serve with a tossed salad to complement this mouthwatering main dish. My friend said I had outdone myself with this pie and asked for the recipe. Even John had no idea I used Almond Breeze as one of the main ingredients. It’s super easy to bake with and I’ll definitely be using it in more of my recipes. It can be used in more in more ways than just smoothies as I’ve shown here. It adds a hint of nuttiness to the bottom crust and is the perfect smooth, creamy base for the sauce. I couldn’t even tell that there wasn’t any dairy in the recipe! I enjoyed its simplicity and versatility. Watch for a yummy cake recipe next month just in time for Mother’s Day. Have you ever used Almond Breeze in your recipes? 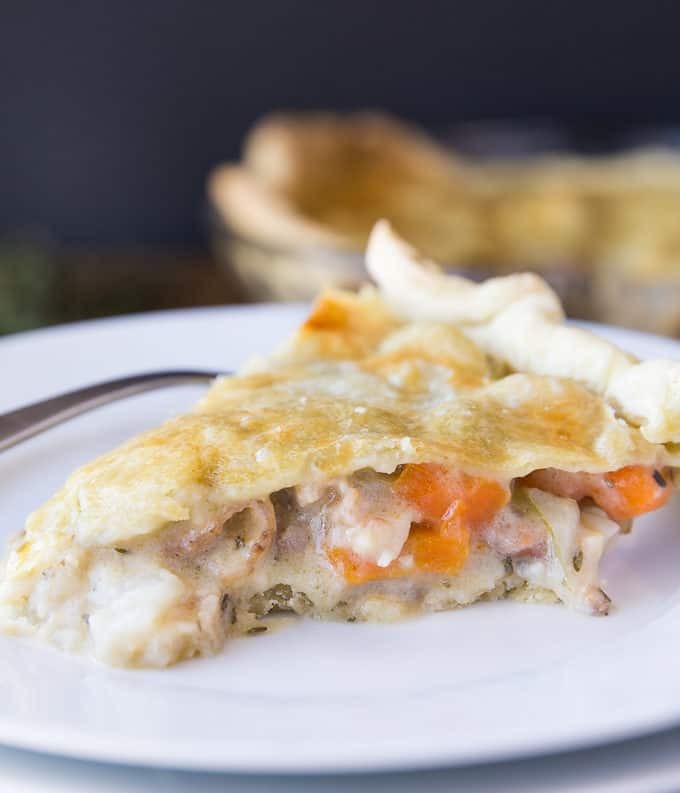 Enjoy this savoury pie with its blend of fresh vegetables, fresh herbs and bacon all tucked into a creamy sauce. Preheat oven to 350F. In a bowl, add flour, pepper and salt and stir to combine. Stir in extra virgin olive oil and Almond Breeze. Press dough evenly on the bottom and sides of a 9-inch pie pan. Preheat oven to 350F. Heat extra virgin olive oil in a large pan over medium high heat. Add in onion, garlic, bacon and carrots. Cook, stirring often, for 5 minutes. Stir in mushrooms and cook for 3 minutes. Stir in flour, rosemary and thyme. Cook for 1 minute. Gradually add in Almond Breeze. Bring to a boil. Reduce heat, cover and simmer for 15 minutes. Remove cover and stir in 1 tsp cornstarch. Stir to thicken. Add in more cornstarch to reach desired consistency. Cook for an additional 5 minutes. Season with salt and pepper. Remove from heat and spoon mixture onto pie crust. Roll out puff pastry to fit the top of the pie. Pinch the edges together. Brush with egg. Bake for 30 minutes, or until golden. Serve hot. This looks delicious! 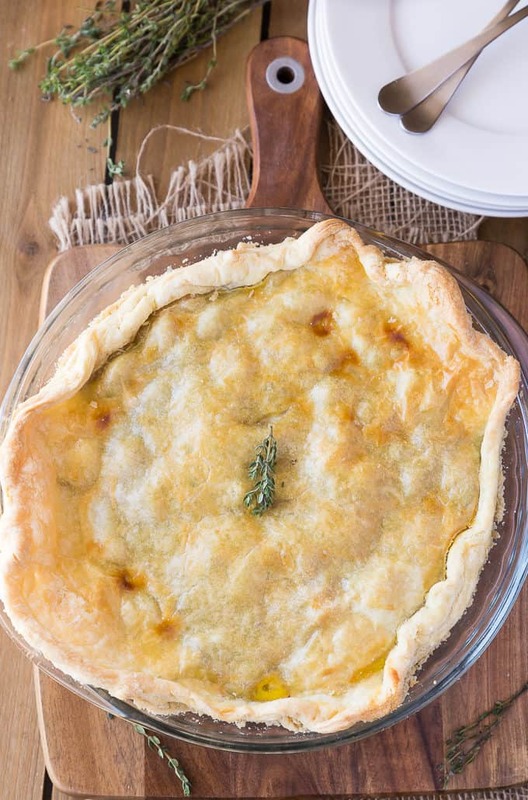 I’ve used Almond Breeze in a dessert recipe but who knew you could use it in a savoury pie! Thanks for sharing! Sounds so yummy. Never thought about using Almond Breeze in a recipe like this. Will definitely have to try it out. This looks delicious! Can’t wait to try it out! I use corn starch quite often to thicken gravy and sauces and to make a wonderful false cream, however I always mix mine with a little cold water and then add it to whatever I’m cooking – otherwise I get lumps. My daughter however just throws it in, stirs like mad and no lumps – I’ve watched her do this but it never ever works for me. 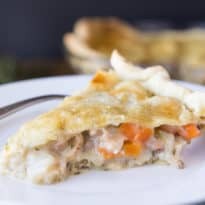 I am not the biggest fan of savoury pies besides the occasional chicken pot pie, but this looks delicious. I think my husband will love this. And I like that the recipe calls for unsweetened Almond Breeze because we always have a carton of that at home! This looks so good. I always have Almond Breeze in my refrigerator for my breakfast oatmeals. A rustic pie is always tasty. This one sounds delicious. That sounds and looks absolutely delicious. All you got to do is throw bacon into anything and I am all yours. I can’t wait to try this. I’m not a savoury pie person either but this looks good. Well I mean, of course it is, it has bacon! Bacon makes anything good! I’ve not cooked with almond milk before but it sounds like a good choice if you have dairy free company. This sounds absolutely amazing- and the Almond Breeze adds just the right texture without the calories! Love it!! 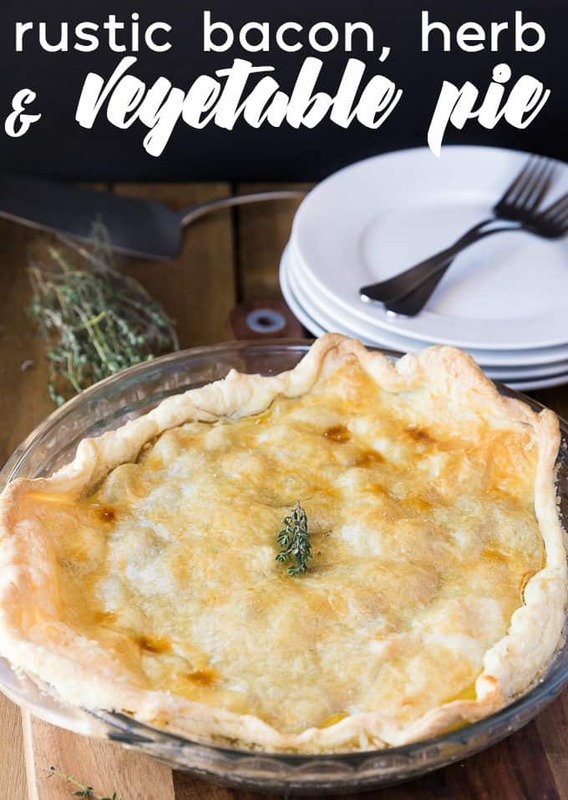 I love savory pies and this recipe looks so good! I will have to try this out the next time we have company over for dinner! It looks so good I am getting hungry just looking at it. The crust really seems to make this look and hopefully taste so good because it is homemade. Only 4 strips of bacon means more to eat while making it. I have used almond milk in my recipes, I like how it tastes! I love any kind of pie and this one looks great. Oh this is a great way to use Almond Breeze. I need to start thinking like this when making recipes. It sounds good! Oh my this looks so delicious. I will have to get the ingredients I need to make this recipe on the weekend. I am sure it will be a hit. I love almond milk! This is such a delish idea…great pics too! This looks so good. I have been wanting to make something like this for a while now. I’m glad I saw this recipe. Looks a lot like pot pie, so I can’t wait to try it. What a creative way to use bacon. I bet that was amazingly yummy and your family loved tasting your recipe. 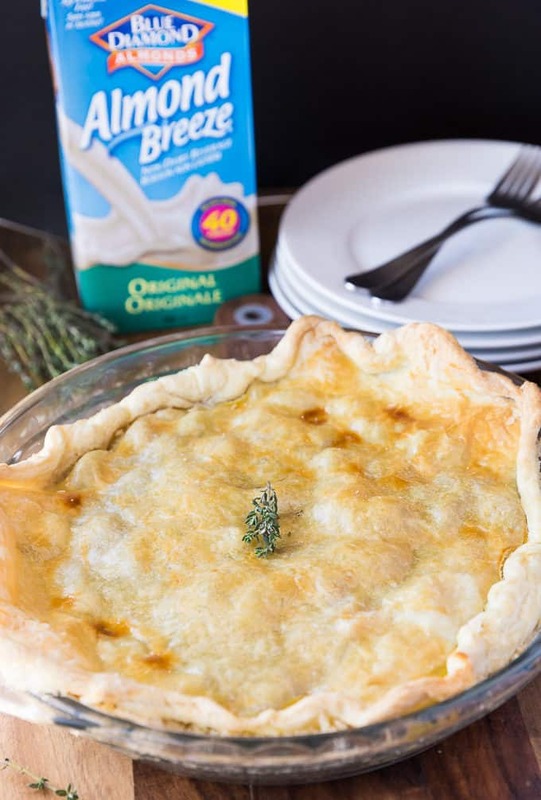 This pie looks so yummy, I love Almond Milk, but haven’t tried cooking with it thanks very much for sharing this terrific recipe. This looks really good!! I’m pretty sure my family will love this pie! You had me at bacon! This looks super delicious! This looks so delicious! I love the rustic look of food!!! Almond milk is a great alternative to dairy. This looks so delicious. I’ll have to make it for my family. Yes I’ve used it for oatmeal, but didn’t think of using it for pie~! This looks amazing, really want to make it, but making the crust from scratch is hard I thought. You make it look easy! This sounds so easy to make but I am sure that people eating would think that it took hours. Now this is a new one! Original and delicious looking! It looks so good I printed it immediately! I love recipes that have leftovers! Cook once eat twice! Have never used Almond Breeze. Will have to give it a try. This looks yummy. This sounds amazing! Can’t wait to try it! Great Vegetable Pie, thanks so much for sharing with us at Full Plate Thursday! Have a great week and come back soon!